Add a live video stream of yourself to your Skype for Business meeting. (And ask others to also.) Learn how to switch from gallery view to speaker view, and about the presenter controls. Click the Video button to see a preview of how you will look to others. Note: This requires a video camera connected to your computer or device. Make any adjustments you need to your camera position. Click the Pick a Layout button in the upper right corner of the Skype for Business meeting window title bar. Gallery view (the default) to show all of the participants' video streams or photos. Speaker View to show the video stream or photo of the person who is currently speaking in the lower-right corner of the meeting window (leaving the stage available to show any content being presented). Content View to show only the content being presented. Right click the video stream or photo of the person you want to control. Mute/Unmute to toggle between muting and unmuting that person. Remove from Meeting to end this Skype for Business meeting session for that person. Make an Attendee/Presenter to toggle that person from attendee status to presenter status. Tap the Video button to see a preview of how you will look to others. This feature is not available on Skype for Business for Android. This feature is not available on Skype for Business for iOS. This feature is not available on Skype for Business for Windows Phone. Skype for Business is not currently available on Mac OS X devices. (This requires a video camera connected to your computer or device.) Click the Video button to see a preview of how you will look to others. Right-click the video stream or photo of the person you want to control. With Skype for Business, you can conduct a face-to-face meeting even when you're miles apart. 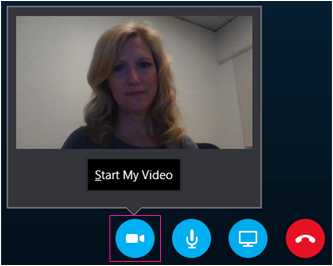 When I'm in a meeting, Skype for Business lets me add video with just one click. "Ok, everyone. Let’s turn on video." First, I’ll click the video button to see a preview of how I'll look to others. Ok, I can live with that. Now I’ll click Start My Video. "Excellent, nice to see you all." This is the Gallery view. If I want to see just the speaker, I’ll switch to the Speaker view. But I usually only do that in very large meetings. As the presenter, I can Mute, Unmute, Remove, or make someone a presenter at any point. I can tell who's speaking by the blue bar under their picture.